NOS still in the box from Ferrari. Used from 456 model – should fit all years of 456. On tank: 2 153519. This tank has been well cared for with no dings or dents;. 456GT, 456GTa. 456MGT and 456MGTa. Updated version New In wrapping! Power steering pump assembly removed from a 2001 Ferrari 360 Spider with 19k miles. Assembly includes pump, support bracket and pulley. There is a small repairable crack at one mounting tab (see photo for detail). Item is an OEM used part in good condition and is covered by our 30 day parts exchange guarantee. Notes: OEM used part Good condition Power steering pump Includes pulley, support bracket 19k miles Part# 173997 (Pump) Part#’s 170926 (Pulley), 176162 (Support) *Cracked mounting tab* Shipping with insurance will run $17 to anywhere in the lower 48 states only. No bids outside this area, please. Auto Works Inc. Madison, WI Stock: 4106. Power steering tank removed from a 2002 Ferrari 360 Spider equipped with a V8 3.6L engine and 40k miles. 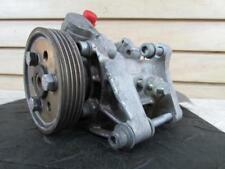 Unit is an OE used part in very good condition and comes with mounting bracket. Item is covered by a 30 day parts exchange guarantee. Notes: **Extra clean** OE used part 40k miles P/N 167002 Includes mounting bracket Exact interchange for this part is not available. Fits 2002 Ferrari 360 Spider. (Will fit other Ferrari models and years, please verify prior to purchase.) Shipping will run $17 to anywhere in the lower 48 states only. No bids outside this area, please. Model: FERRARI. Power Steering Pump/motor. Part Grade Abbreviations. cc = Credit Card size units. C = Greater than 200k miles. B = Greater than 60k miles and less than or equal to 200k miles but greater than 15k miles per year. Part # 177360 ; Fits the following models . Good Condition. Sold As Pictured. USED / OEM. 355 f1 box-6cPartC. USED & OEM, Part #170860 ; Fits the following models. Free Shipping! Power Steering Hydraulic Pump & Pulley 198036 195936 599 GTB Fiorano GTO SA Aperta Enzo 2009; *Damage See Photos . 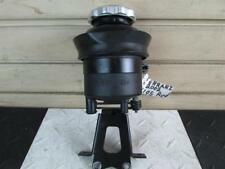 NEW and OEM.part# 113350 ; Fits the following models : 308 GTB/GTS JAP, 308 GTB/GTS USA. New / OEM. Part # 157350 ; Fits the following models : 456 GT, 456 GT Auto, 456 GT/GTA. Call us if you need hard to find screws, washers, nuts, bearings, bushings, bolts or any other part ! Part # 139511 ; Fits the following models : Mondial t Coupe & Cabriolet. New / OEM. 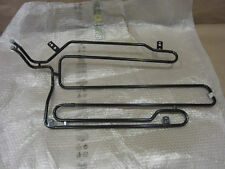 Part # 170617 ; Fits the following models : F355 ABS BOSCH/355 F1. 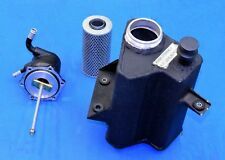 Power Steering Fluid Oil Reservoir Tank Bottle 292342 Oem Ferrari California 2010; 458 599 612 F12 Laferrari . Trending at $35.20eBay determines this price through a machine learned model of the product's sale prices within the last 90 days. NEW / OEM, . part # 178181; Fits the following models Ferrari 550 M.
Clutch actuator (gearbox) hydraulic oil reservoir removed from a 2002 Ferrari 360 Spider with 40k miles. Part number is 167002. (Same unit is used for the power steering reservoir.) OE used part in good condition with scuffing along lip of reservoir cap. Includes (gearbox) hoses and ring clamps. Item comes with a 30 day parts exchange guarantee. Notes: OE used part P/N 167002 Power steering reservoir Gearbox hyd. oil reservoir Exact interchange is not available for this part. Fits 2002 Ferrari 360. (Unit may fit Ferrari Spider and Modena model years 2002-2009, please verify prior to purchase.) Shipping will run $17 to anywhere in the lower 48 states only. No bids outside this area, please. Stock: 4105 Location: Vette Bin 1 72018. Part # 171835 : Fits the following models : 456 GT, 456 GT Auto, 456 GT/GTA, 456 MGT/MGTA (def) 1998, 456 MGT/MGTA (prev), 550 Maranello, F50. Trending at $235.00eBay determines this price through a machine learned model of the product's sale prices within the last 90 days. Part number 263796. Ferrari 458 Power Steering Sending Oil Pipe Line Hose. Original Ferrari Production. 100% GENUINE FACTORY FERRARI PART. Rare part to find new in original. Part # 179301 : Fits the following models : 360/360 F1 Spider ,430 Coupe. USED & OEM. Part# 240609 ; Fits the following models : California. loc: WRM Box. Good Condition. Sold As Pictured. USED / OEM. 355 f1 box-6cPartB. Good Condition. Sold As Pictured. USED / OEM. 355 f1 box-6cPartD. Part # 185353 ; Fits the following models : 360 ALL. New / OEM. 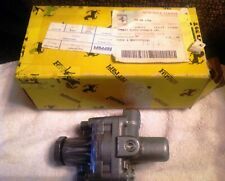 Part # 164231 : Fits the following models : 360/360 F1 Modena. Call us if you need hard to find screws, washers, nuts, bearings, bushings, bolts or any other part ! See (16) In Diagram.NEW and OEM.Part# 209239; Fits the following models : 612 Scaglietti. Part # 175020 ; Fits the following models : 456 MGT/MGTA (prev). All Pipes Pictured. Good Condition. USED & OEM, PART # 255860 - 250207-250244-250245;Fits the following models :California. FERRARI PART# 173997. NEW GENUINE FERRARI. POWER STEERING PUMP. Good Condition. USED / OEM, Part # 198680 ; Fits the following models : 430 Challenge (2006), 430 Coupe, 430 Spider. Call us if you need hard to find screws, washers, nuts, bearings, bushings, bolts or any other part ! Part # 155178 ; Fits the following models : 456 GT, 456 GT/GTA. On the 612 it is the pipe from rack steering box to union, New / OEM, Part # 179256 . Ferrari # 262505 - Power Steering Line Radiator. 458 Italia. Fits 458 Challenge.